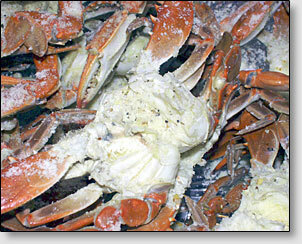 Unlike Maryland style steamed crabs, where the whole (live) crabs are seasoned, steamed, then cleaned, New Jersey style crabs are cleaned first. As Captain Williecrab says, "Only barbaric heathens do not clean a crab first, they cook a whole crab alive and cook his guts in the meat instead of wonderful spices and things like garlic." With the carapace off, remove the spongy gills (known as the "dead man's fingers") and wash out the entrails (guts) using a high-pressure water spray (e.g., use a garden hose with a spray nozzle). 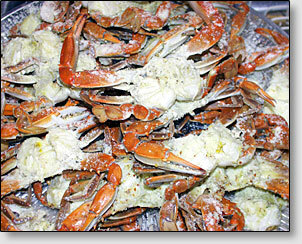 Using your thumb and index finger, grasp the crab's mouth parts, twist off, and discard. Turn the crab upside down and, using a knife or other sharp object, pry up and remove the crab's apron which is folded up under its body. Rinse thoroughly. At this point you should have a squeaky clean crab body with all legs and claws attached. The main body should be completely clean and consist of nothing but glistening white shell with meat inside. This recipe is from Capt. Williecrab, creek explorer of Millville, New Jersey.